Like to throw a good summer party? Need a ground zero to hold all your drinks, food and rock out some music? Then this Ultimate Party Station is for you! The Ultimate Party Station is the perfect solution for those neighborhood parties. Fill it up with all your party swag and roll it to the end of your driveway, in the back yard, or down the street. Wheel it to your favorite spot and then after a few quick transformations it’s party time! It has a two-piece sliding top that separates to reveal a large compartment perfect for a cooler of your favorite beverages. The main top is great for serving up your food and a folding shelf on the back of the Party Station can be pulled up to hold even more goodies or used as a pull up bar top. The Party Station was a hit with our little ones. Though they were too busy enjoying the fruit punch to be concerned with pictures! 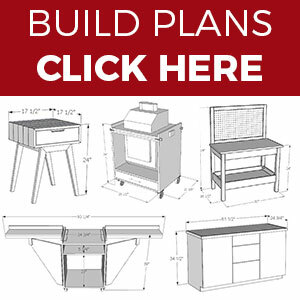 The plans for this Ultimate Party Station can be found over at the RYOBI Nation Projects Page. As part of my build I added several upgrades to the advanced plans. The biggest upgrade was adding some music! I mean, what’s a party without some music? I also added an umbrella, and 2 drawers to give a more elegant storage solution. For the audio I used marine speakers so they can withstand water without a problem. I bought these Boss 5.25″ two-way speakers from Amazon for under $25. Of course you need a way to power the speakers as well, and I used a small Lepai 20W amplifier I picked up for under $35. These aren’t super high end products, but they sound really good in the cart. I was actually pleasantly surprised! To add the speaker setup I used the included mounting template and laid out where I wanted the speakers. Then I drilled a starter hole and used the jigsaw to cut out the holes in the Party Station. Next I mounted the speakers with stainless steel 3/4″ screws and ran the wires over to the amplifier. I mounted the amplifier in front corner for easy access, and built a small enclosure around it and the power source to protect them. I drilled a hole in the back of the Party Station for an extension cord to run through. This powers the amplifier and if you wanted to install a surge protector you could also power other things like a phone charger, fan, etc. I also drilled a hole for the umbrella and attached a 1-1/4″ strap up high to keep it steady. To deliver the music to the amplifier you hook up your phone through a standard headphone jack on the back of the amp. I used a little phone holder I built to hold the phone while it’s playing music. 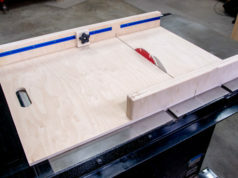 One other build tip is how I made the inset drawer front on the side. I fully assembled the side of the cart first. Then I marked out where I wanted the drawer to go and taped it off with blue tape to prevent splintering when I cut. I used a straight edge clamp (love that thing by the way) as a guide and did a plunge cut using the circular saw and then finished it off with the jigsaw. Then glue the boards you cut out together and you have your drawer front. 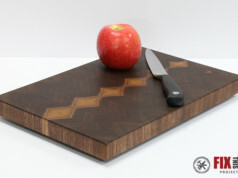 Attach this to a simple draw made of 1/2″ plywood and you’re good to go. This was such a fun build and I really enjoyed working with the RYOBI team. I got started using RYOBI tools and they are such a great value. And they have great new tools like their Cordless 18ga Brad Nailer that I used to attach some of the pieces temporarily before screwing in. It is an amazing tool I highly recommend it! 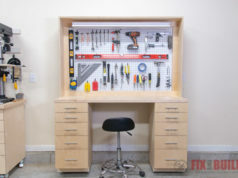 Go on over to the RYOBI NATION project page and build one of these for yourself! Want more great content? Sign up for my e-mail notifications of when I post new content. RYOBI provided me with tools and/or monetary compensation to support this giveaway. All opinions are my own and are unfiltered by RYOBI. Affiliate links are provided in this post for your convenience. Purchasing through these links helps support the site and lets me build and share more projects and plans!